Hip Joint Exercise - From a Stable Core! Our hips act as the kingpin of the body. Doing specific hip joint exercise with a stable pelvis can help improve your posture and, in turn, decrease pain. Because the pelvis absorbs the shock of the lower body and gravity from the upper body doing exercises to stabilize this area can keep your body balanced and pain free. It is very hard to determine, for most of us anyway, where our pelvis is in space. One of our hips could be rolled forward or higher than the other. This could result in tightness in the lower back and weakness in the abdominal muscles. The Pilates Pelvic Triangle or Clock is a great way to find neutral position for the spine and pelvis and is what will keep your body in balance during your exercise session. To find this triangle put your hands on your hip bones, then reach your index fingers to your pubic bones, and reach your thumbs across just below the navel. There should be no tilt forward or back of the pelvis, it is all in a level triangle. Now, you can work around the pelvic clock by imagining you are swishing water from your navel to your 9 o'clock hip, to your 6 o'clock tailbone, to your 3 o'clock hip, and then back to your navel at 12 o'clock. This hip joint exercise helps to really strengthen the pelvic floor muscles at all four points. To find more of these pelvic and hip exercises check out the new Pilates Ebook available here with loads of hip joint exercise moves to help stabilize the hip and pelvic region so you can move with ease and efficiency. Because the hip is a ball and socket joint the muscles can be worked in 4 different planes of movement. 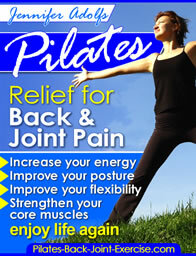 Listed below are several Pilates mat exercises that can work the hip in all 4 of these planes. Hip Flexion exercises are important to work the muscles that lift the knee as we walk. Lying on your back and keeping your knee in line with your hips and armpits bring one knee to your chest and extend the other leg. Bringing your head up while doing this exercise will work the core muscles as well. Switch legs, repeating for about 6-10 repetitions. Hip extension exercises are important not only as stretching exercise for the hip, but also to strengthen the muscles that stabilize the hip and pelvis from the gluteal muscles and hamstrings. Kneeling on your hands and knees and keeping the spine in a neutral position extend one leg back until it is parallel to the floor. Once you can accomplish this with some stability extend the opposite arm in unison. Adduction is any motion of bringing a body part back to the center of the body. In this case it would be swinging the leg at the hip towards the midline of the body. With this action you will feel the muscles of the inner thigh working. Standing tall swing the leg out to the side and then across the body with the heel coming just in front of the toes on the standing foot. You can do these with or without tension or weight. Side lying position with hips and shoulders stacked, top leg should be bent over the bottom leg. Lift the bottom leg up towards the ceiling keeping the foot flexed and leg extended. Repeat up to 10 times on each leg. Abduction is any motion that takes a body part away from the mid line of the body. In this case the hip joint exercise is swinging the leg away from the midline of the body and you will feel the muscles of the outer thigh working. Standing tall swing the leg out to the side as far as you can without leaning the other direction then draw it back to you. Side lying kicks position with hips and shoulders stacked, lift the top leg towards the ceiling keeping hips aligned, then flex the foot and reach it straight down over the other leg. Find more free information about the hip and hip joint exercise here.